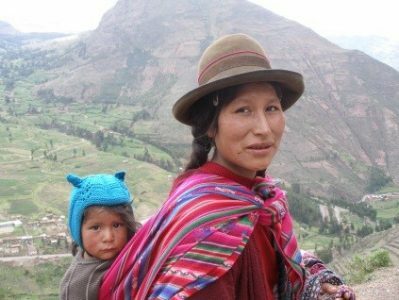 Photo: Kichwa woman with her child in the Andes. Kichwas or Quechuas are the original indigenous people of Ecuador. The Kichwa (or Quichua) in Ecuador are part of the larger ethno-linguistic Quechua group that stretches across the South American Andean highlands from Colombia to Chile. In Ecuador, the Kichwa are divided into different “pueblos” or peoples spread across the spine of the Andes mountains (the Chibuleos, Karankis, Kayambis, Kisapinchas, Kitus, Otavalos, Panzaleos, Pastos, Puruhaes, Quisapinchas, Salasacas, Saraguros, and Tomabelas), as well as related groups in the eastern upper Amazon basin. Together they comprise the largest indigenous nationality in Ecuador, numbering in the millions of the country’s fourteen million inhabitants. They account for at least 7% of the population, although mestizos, who are mixed with them, are 70%. Ecuadorian – Kichwas represents 115 unrelated Amerindian Kichwas and Blacks born and living in Ecuador who were sampled in 2005 by the University of Zaragoza, Spain. Source publication: Genetic analysis of the Amerindian Kichwas and Afro-American descendants’ populations from Ecuador characterized by 15 STR-PCR polymorphisms, FSI, 2006, p231-235.